The global spread and increasing incidence of carbapenem-resistant Enterobacteriaceae have resulted in treatment and public health concerns. Here, we present an investigation of the molecular mechanisms and clonality of carbapenem-non-susceptible Escherichia coli (CnSEC) based on a nationwide survey in Taiwan. We collected 32 and 43 carbapenem-non-susceptible E. coli isolates in 2010 and 2012, respectively. The genes encoding cabapenemases and plasmidic AmpC-type and extended-spectrum β-lactamases (EBSLs) were analyzed by polymerase chain reaction (PCR). The major porin channels OmpF and OmpC were evaluated by sodium dodecyl sulfate-polyacrylamide gel electrophoresis (SDS-PAGE). Molecular typing was performed with pulsed-field gel electrophoresis (PFGE) and multi-locus sequence typing (MLST). The resistance rates of CnSEC isolates to cefazolin, cefotaxime, cefoxitin, ceftazidime, and ertapenem were all 100%, and most (94.7%) isolates were CMY producers. The main mechanism of CnSEC in Taiwan is via plasmidic AmpC β-lactamase CMY-2 and DHA-1 in combination with the loss of OmpC/F. In 2010, one isolate was confirmed to harbor bla IMP-8; a KPC-2 producer and an NDM-1 producer were detected in 2012. No isolate had VIM- or OXA-carbapenemases. ST131 was the predominant ST type (33.3%). PFGE revealed no large cluster in CnSEC isolates in Taiwan. The co-existence of plasmidic AmpC β-lactamase and outer membrane protein loss is the main mechanism for CnSEC in Taiwan. The emergence of KPC-2 and NDM-1 in 2012 and the predominance of ST131 warrant close monitoring and infection control. Escherichia coli is an important member of Enterobacteriaceae that is evolving drug resistance mechanisms. Extended-spectrum β-lactamases (ESBLs) conferring resistance to extended-spectrum cephalosporins lead to treatment failure by penicillins and cephalosporins and are prevalent in E. coli isolates from hospital patients, community members, farm animals, and food. Carbapenems are powerful antibiotics that are not inactivated by ESBLs and AmpC β-lactamases and therefore are regarded as the last line of treatment for infections by ESBL producers. Carbapenem resistance in Enterobacteriaceae, particularly Klebsiella pneumoniae, has recently been reported worldwide, whereas carbapenem-resistant E. coli is relatively rare . Nonetheless, carbapenem resistance in E. coli should be closely monitored because of its potential to spread in both hospital and community settings . The mechanisms of carbapenem resistance in Enterobacteriaceae are the presence of either carbapenemase or a combination of β-lactamases and porin loss [3–7]. There are three types of carbapenemases that hydrolyze carbapenems, including class A (penicillinases), class B (metallo-β-lactamases), and class D (oxacillinase). Although IMP- and VIM-MBLs have typically been the most common types of MBLs found in Enterobacteriaceae , KPC (class A) enzymes are now the most predominant carbapenemases worldwide . Carbapenemase-harboring E. coli is relatively less reported, though the first report of KPC-2 in E. coli was in 2006 . This could be because carbapenem resistance does not occur naturally in E. coli, and it has been reported that plasmid transfer between K. pneumoniae and E. coli does not readily occur . With regard to ESBL-producing E. coli, pandemic E. coli MLST type ST131 with CTX-M β-lactamase is spreading ; thus, whether the spread of carbapenem resistance in E. coli is related to certain clones warrants investigation. Accordingly, we initiated a nationwide surveillance program in 2010 and 2012 to investigate the molecular epidemiology of imipenem- or meropenem-non-susceptible E. coli in Taiwan. Participating hospitals in the national survey identified imipenem- or meropenem-non-susceptible E. coli and sent all these isolates to a reference laboratory in National Health Research Institutes, Taiwan. A total of 32 imipenem- or meropenem-non-susceptible E. coli isolates were consecutively collected from eight hospitals participating in 2010 (five medical centers and three regional hospitals), with 43 collected from 17 hospitals (eight medical centers and nine regional hospitals) in 2012 . All the isolates were from individual cases. This study was approved by the institutional review board of Kaohsiung Medical University Hospital (IRB No. KMUH-IRB-2 0130328). The isolates were obtained as part of routine hospital care procedures, and written informed consent for participation in the study was waived. The primary screening for carbapenem resistance was performed by the individual participating hospitals using the disc diffusion method. Species identification was performed by standard biochemical methods: the API system or the Vitek2 automated system. Further confirmation of antimicrobial susceptibility was determined by the broth micro-dilution method according to the guidelines of the Clinical and Laboratory Standards Institute (CLSI) . In early 2012, CLSI revised the ertapenem breakpoints; thus, to compare the MIC results from different years, we used CLSI (M100-S22-U, 2011)  to interpret the ertapenem susceptibility results. For the susceptibility testing results, only isolates from the eight hospitals that participated in both 2010 and 2012 surveillance projects were analyzed and compared. The following anti-microbial agents were tested: cefazolin, cefotaxime, ceftazidime, cefepime, cefoxitin, ertapenem, imipenem, meropenem, doripenem, gentamicin, amikacin, ciprofloxacin, trimethoprim-sulfamethoxazole, colistin, and tigecycline. Quality control was performed using E. coli ATCC 35218 and ATCC 25922 reference strains. Carbapenemases (class B families, IMP, VIM, NDM, GIM, SPM, and SIM; class A families, NMC, IMI, SME, KPC, and GES; class D, OXA-48), plasmidic AmpC (CMY, DHA, and ACT) , and ESBL genes (CTX-M, TEM, and SHV) were detected by PCR amplification . Primers for the class B carbapenemase NDM-1 were newly designed for this study (NDM-1F, TCTCGACATGCCGGGTTT; NDM-1R, GAGATTGCCGAGCGACTT). The amplicons were sequenced, and the entire sequence of each gene was compared to the sequences in the GenBank nucleotide database at http://www.ncbi.nlm.nih.gov/blast/. Plasmid conjugation was performed using E. coli J53 AzR as the recipient strain. The recipients and bla NDM-1-carrrying donor samples were separately inoculated into brain-heart infusion broth and incubated at 37°C for 4 h. The samples were then mixed at a ratio of 10:1 (Donor:Recipient, by volume) for overnight incubation at 37°C. A 0.1-ml aliquot of the overnight broth mixture was spread onto a MacConkey agar plate containing sodium azide (100 μg/ml) and imipenem (1 μg/ml). The plasmids were extracted from these transconjugants using the standard alkaline lysis method, and fingerprints of the plasmids were generated by digestion with HincII or PvuII (New England Biolabs, Beverly, MA). Total DNA was prepared, and PFGE was performed as described . The restriction enzyme XbaI (New England Biolabs, Beverly, MA) was used at the temperature suggested by the manufacturer. The restriction fragments were separated by PFGE in a 1% agarose gel (Bio-Rad, Hercules, CA) in 0.5× TBE buffer (45 mM Tris, 45 mM boric acid, and 1.0 mM EDTA, pH 8.0) for 22 h at 200 V at a temperature of 14°C, with ramp times of 2–40 s using a CHEF Mapper apparatus (Bio-Rad Laboratories, Richmond, CA). The Dice coefficient was used to calculate similarities, and the unweighted pair-group method with the arithmetic mean method was used for the cluster analysis with BioNumerics software version 5.10 (Applied Maths, St-Martens-Latem, Belgium). Similarity PFGE patterns Hospital ST Cluster. Bacterial outer membrane proteins (OMPs) were prepared as described . The OMPs were then separated by sodium dodecyl sulfate-polyacrylamide gel electrophoresis (SDS-PAGE) through 7.5% polyacrylamide-6 M urea gels and visualized by Coomassie Blue staining (Bio-Rad). A reference strain, E. coli ATCC25922, was included as a control. Figure 1 shows representative SDS-PAGE results to illustrate the interpretation of OmpC and OmpF loss. Outer membrane profile of ATCC control isolates and clinical isolates of E. coli from this study. Lane 1 shows the expression of OmpC, OmpF, and OmpA in the ATCC25922 control strain. Lane 2 shows OmpF deficiency; Lane 3 shows OmpC deficiency; Lane 4 shows both OmpF and OmpC deficiency. MLST with seven housekeeping genes , adk (adenylate kinase), fumC (fumarate hydratase), gyrB (DNA gyrase), icd (isocitrate dehydrogenase), mdh (malate dehydrogenase), purA (adenylosuccinate synthetase), and recA (ATP/GTP motif), was performed on all isolates according to the protocol described on the E. coli MLST website (http://mlst.ucc.ie/mlst/dbs/Ecoli/documents/primersColi_html). The allele sequences and sequence types (STs) were verified at the http://mlst.ucc.ie/mlst/dbs/Ecoli/ website. All isolates were resistant to cefazolin, cefotaxime, ceftazidime, cefoxitin, and ertapenem. With the exception of amikacin, the rates of resistance to the other tested antimicrobial agents increased in 2012. For the eight hospitals that participated in both the 2010 and 2012 surveillance projects, the resistance rates of imipenem, meropenem, doripenem, and cefepime increased significantly (P < 0.05) (Table 1). Indeed, the resistant rates to imipenem, meropenem, and doripenem were 56.3%, 31.3%, and 15.6%, respectively, in 2010 and increased to 72.1%, 58.1%, and 51.2%, respectively, in 2012. All isolates were susceptible to tigecycline and colistin in 2010, whereas the resistant rates to tigecycline and colistin were 7.0% and 2.3%, respectively, in 2012.
a SXT: Trimethoprim/sulfamethoxazole. Trimethoprim/sulfamethoxazole MICs are presented according to the concentration of trimethoprim in 2010. Of the 75 E. coli isolates, five were not typable by PFGE. No major cluster was found, except for two pulsotypes with 4 and 2 isolates each (Figure 2). The PFGE results suggested that clonal spread was not responsible for the emergence of carbapenem-resistant E. coli. 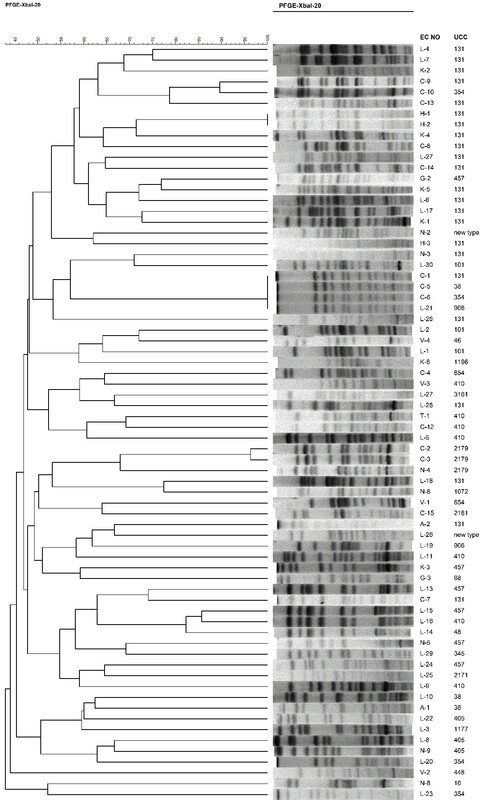 A dendrogram of the pulse-field gel electrophoresis (PFGE) fingerprinting results and the ST types of 70 typable E. coli isolates. Based on MLST, ST131 was found to be the major sequence type. Of the 75 E. coli isolates, ST131 was detected in 25 isolates (9 isolates in 2010 and 16 isolates in 2012). Seven isolates were assigned to ST410, and six isolates were assigned to ST457. ST405 and ST101 were found in three isolates each. The remaining isolates exhibited diverse ST types. The isolates of MLST type ST131 showed no significant difference in distribution in 2010 and 2012 and displayed highly diverse PFGE patterns. In 2010, all the isolates were negative for KPC-, NDM-, VIM-, and OXA- carbapenemases, though one isolate was confirmed to harbor bla IMP-8. In 2012, one KPC-2-producing isolate and one NDM-1-producing isolate were detected, whereas no IMP-, VIM-, and OXA-type carbapenemases were found. In Asia, KPC-producing Enterobacteriaceae was first detected in K. pneumoniae in China in 2004  and was also soon found in Citrobacter freundii, E. coli, and Serratia marcescens[22, 23]. In Taiwan, the first three KPC-2-positive patients were detected in K. pneumoniae isolated from patients having been hospitalized in China [24, 25]. Since then, KPC-2-producing K. pneumoniae has been increasingly reported in Taiwan , though few cases of KPC-positive E. coli have been reported . In the present report, we identify the first KPC-2-positive E. coli from Taiwan. This KPC-2-containing E. coli was obtained from a 78-year-old female who had not been abroad but was transferred from a regional hospital to a middle Taiwan medical center for a urinary tract infection. The KPC-2-containing isolate also produced TEM-1, CMY-2, and CTX-M-3/CTX-M-22 β-lactamases and was classified as MLST sequence type 410 (ST410). To date, KPC-producing E. coli has only been reported in Israel, the USA, China, Brazil, France, Greece, and Ireland [10, 12, 22, 28–31], and two major sequence types containing KPC-carbapenemases have been reported. ST131 was reported in France , the USA , and Ireland ; ST410 was reported in Greece  and Israel  (ST471 in the Pasteur Institute typing system is the same as ST410 in the UCC typing system). The possibility that ST131 and ST410 are future epidemic clones of KPC-2-producing E. coli worldwide is of great concern. We also report the first NDM-1-harboring E. coli isolate in Taiwan. Interestingly, an NDM-1-positive K. pneumoniae was detected in the same hospital during the same period and was included in the study to compare the two NDM-1-containing plasmids. The two NDM-1 plasmids from K. pneumoniae and E. coli were successfully transferred to the recipient isolate E. coli J53. Additionally, the plasmid digestion profiles of the two NDM-1 plasmids revealed different patterns (Figure 3), indicating that plasmid spread is less likely. Our E. coli NDM-1 producer possessed TEM-1 and CMY-2 but did not encode CTX-M β-lactamases and 16S rRNA methylase genes, which are commonly found in bla NDM-1-positive isolates . Thus far, ten sequence types (ST101, ST405, ST648, ST90, ST410, ST156, ST131, ST167, ST224, and ST38) of E. coli have been reported to contain NDM-1 . However, the ST type of the NDM-1 clone described herein is ST345, which has not yet been reported to harbor NDM-1. This finding supports a conclusion that bla NDM-1 occurs in E. coli belonging to diverse phylogenetic lineages  and also emphasizes the need to study the plasmids carrying bla NDM-1 in E. coli. Hinc II- or Pvu II-digested plasmid profiles of transconjugants of NDM-1-carrying K. pneumoniae and E. coli . All 75 isolates carried AmpC β-lactamase CMY and/or DHA-1; most of the isolates produced CMY-2 (68 isolates, 90.7%), and one CMY-4-carrying isolate was detected in 2012. DHA-1 was detected in six isolates in 2010 and one isolate in 2012. CTX-M-type ESBLs were detected in 13 isolates (40.6%) in 2010 (ten isolates exhibited CTX-M-14, and three each exhibited the CTX-M-14/CTX-M-15, CTX-M-14/CTX-M-55, or CTX-M-27/CTX-M-55 combinations), and ten isolates (23.3%) harbored CTX-M genes in 2012 (three isolates harboring CTX-M-14, three with CTX-M-79, two with CTX-M-15, and one each with the CTX-M-14/CTX-M-79, CTX-M-3/CTX-M-15 combination). The 75 carbapenem-non-susceptible E. coli isolates showed the loss of at least one porin, whereas 42 (56%) isolates had lost both OmpC and OmpF. Sixteen (21.3%) isolates exhibited OmpF loss, and ten (13.3%) isolates exhibited OmpC loss. Our study revealed that the main mechanism of imipenem or meropenem non-susceptibility in Taiwan is AmpC β-lactamase CMY-2 and DHA-1 in combination with OmpC/F loss (Table 2). It has been previously verified that such a combination of mechanisms can contribute to carbapenem resistance [6, 7]. Most of the isolates were CMY producers (94.7%), and this most common CMY enzyme (CMY-2) of carbapenem-non-susceptible E. coli is also frequently found in cephamycin-resistant E. coli in community-acquired urinary tract infections in Taiwan . a Most isolates have multiple β-lactamase genes. The priority for the determination of β-lactamase in this table is carbapenemases, AmpC enzymes, and then ESBLs. No duplicate calculation was performed for each isolate. E. coli sequence type ST131 is a pandemic clone associated with the CTX-M-15 gene and is resistant to fluoroquinolones . Clone ST131 potentially harbors a variety of β-lactamase genes, most commonly CTX-M β-lactamases, followed by TEM, SHV, and CMY β-lactamases , and its dissemination has contributed to the spread of CTX-M-15-producing E. coli. Of the 75 carbapenem-non-susceptible E. coli isolates, 25 (33.3%) were the ST131 type; of these, 23 isolates displayed a resistant to ciprofloxacin. However, most of the isolates (18/25, 72%) did not produce CTX-M-type β-lactamases. Thus, our results showed that E. coli ST131 is the predominant ST type of carbapenem non-susceptible E. coli in Taiwan but that it is not highly associated with CTX-M ESBLs. Our findings are similar to the results of Kim et al. and support the conclusion that the ability of the ST131 clone to acquire resistance genes under selective pressure could be high. We found that the low prevalence of CTX-M-type β-lactamases was most likely linked to the identification of a low amikacin resistant rate in this study. Amikacin resistance mediated by 16S rRNA methylase (armA and rmtB) in Gram-negative bacteria is an emerging resistance mechanism , and our previous study found that the 16S rRNA methylase gene (armA and/or rmtB) and the CTX-M gene were located on the same plasmid . The low prevalence of CTX-M-type β-lactamases and the low amikacin resistant rate suggested the lack of an endemic plasmid to transfer both bla CTX-M and 16S rRNA methylase genes for carbapenem-non-susceptible E. coli. OmpC and/or OmpF deficiency combined with AmpC (major CMY-2 and DHA-1) was found to be the major mechanism for the development of carbapenem non-susceptibility in Taiwan. The dominant clone of carbapenem-non-susceptible E. coli in Taiwan is ST131, which has also been found worldwide, and the high prevalence of this ST type illustrates the epidemic potential of this clone. The introduction of KPC-2 and NDM-1 into E. coli in Taiwan warrants further monitoring with regard to the epidemiology of carbapenem resistance, the resistance mechanisms, and the potential epidemic clones. This work was funded by the project DOH101-DC-1024 (Epidemiology of multidrug-resistant bacteria in Taiwan: mechanisms of antibiotic resistance and clinical relevance) grant from the Taiwan Centers for Disease Control. All authors declare no conflict of interest. The authors thank the Taiwan Carbapenem Resistance Study Group for the collection of isolates from Keelung Chang Gung Memorial Hospital, Tri-Service General Hospital, Taipei Veterans General Hospital, Linkou Chang Gung Memorial Hospital, China Medical University Hospital, Chiayi Chang Gung Memorial Hospital, Kaohsiung Chang Gung Memorial Hospital, Kaohsiung Medical University Hospital, National Taiwan University Hospital, Taoyuan Armed Forces General Hospital, Buddhist Tzu Chi General Hospital, Hualien Armed Forces General Hospital, National Yang-Ming University Hospital, Taichung Armed Forces General Hospital, Chi Mei Medical Center, Kaohsiung Armed Forces General Hospital, and Kaohsiung Municipal Hsiao-Kang Hospital. We would like to express our gratitude to Dr. Jodge Jacoby for providing the E. coli J53 recipient strain. ML and PLL contributed to the data analysis and wrote the primary draft of the manuscript. LKS, JCL, TLW, CPF, JTW, PLL, and YCC participated in the study design and experiments. PLL and YCC reviewed and revised the paper. All authors have read and approved the final manuscript.